SLOWS is the solo project of musician/producer Matthew Simms. Following 2015’s purely Farfisa based 10” single which sold out in a week; the next full length LP draws upon hours of endless home recordings of improvised modular synth and farfisa organ, processed and distressed through old analog delays and reverbs. Repetitive, Cosmic and minimal. Drones and arrangements of the likes of Terry Riley, JD Emmanuel and “Dreamweapon” era Spacemen 3. When not on his own, Matthew can be found in an incredibly broad range of musical situations; since 2010 he has been a member of influential UK art-rock band WIRE, he has lead the lo-fi cosmic pop of IT HUGS BACK since 2006 and balanced singing bowls and hit his guitar with drum sticks for Experiemtal-Improv-Prog band UUUU since 2016. 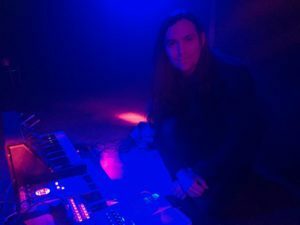 He is also found in a wide variety of studio situations, recently playing guitar for Bill Fay and for soundtrack to the film “Suzanne” by Electrelane’s Verity Susman and producing and mixing the acclaimed lo-fi indie pop of Chastity Belt for two albums on Hardly Art/Sub Pop. See and hear more about Slows at this website.